Venice is one of the most romantic cities in the world, it is a place where romance meets history and it will for sure leave you breathless. Venice is one of the most famous and visited cities in the world, millions of tourist come each year to admire its beauty. 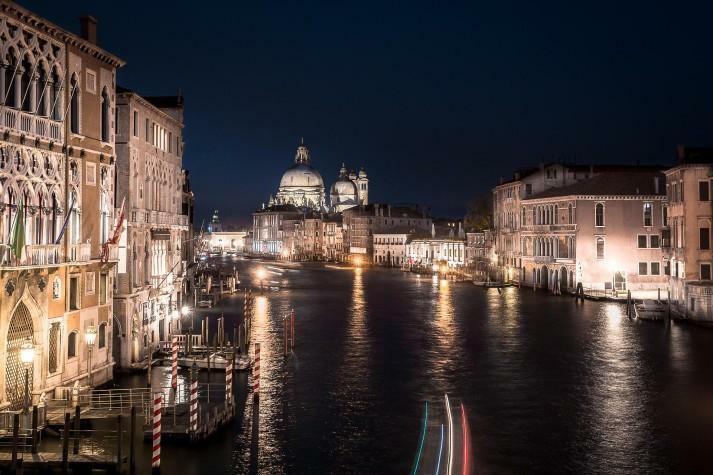 Venice has 118 islands intersected by 150 canals and connected by more than 400 bridges, which puts it on the third place of European cities with most bridges, after Hamburg and Amsterdam. The best way to see the city is definitely on foot, walking through those magical narrow streets, small squares and hundreds of bridges discovering the history of the city. 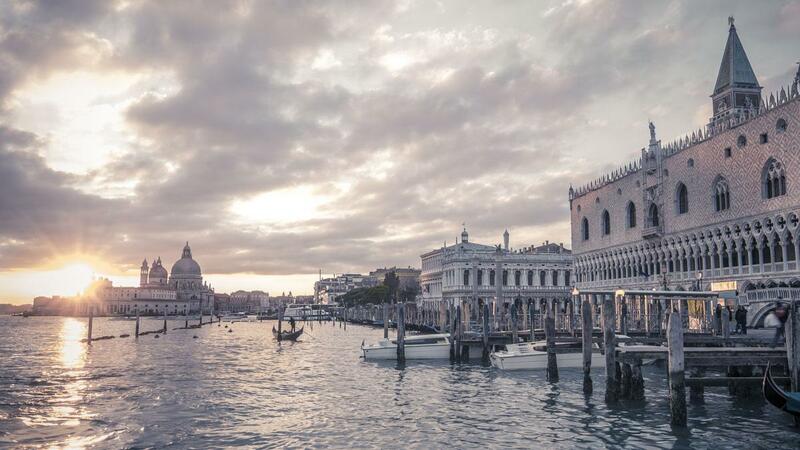 But don’t forget to take a tour with Vaporetti (water buses) where you will see Venice from another perspective, but try to pick the hours when they are not crowded so you can enjoy the view. Another great choice to see the city passing through the maze of small canals is by Gondola, the ancient Venetian transport mode, where you can enjoy a 30 minutes tour under some of the most famous Venetian bridges. Other than visiting all the magnificent landmarks in Venice you absolutely need to try some of these typical Venetian foods. Italian meals are part of the Mediterranean diet, they are made of fresh vegetables, fish, rice, pasta, typical local herbs, spices and, of course, the extra virgin olive oil. Be careful in choosing the restaurant where to eat, because there are lots of them in the center that are only rip off restaurants where you will pay too much for something that is not good at all. 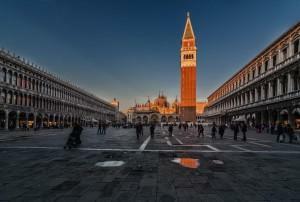 Before going to Venice take a look on Tripadvisor for reviews on restaurants. Veneto is a famous Italian wine producing region, so try some local wines like Prosecco, Valpolicella, Cabernet or Bardolino. Cicheti are small bites served as an appetizer with a glass of good wine. As an appetizer you can also try tramezzini, small triangular sandwiches filled with all kinds of ingredients, they are really tasty. Some of the typical local dishes are Fegato alla Veneziana (sliced liver with onions), Risi e Bisi (Risotto with beans), Baccala mantecato (salt cod cooked with milk), Sardelle in saor (cooked pilchards with onions, raisins and pine nuts), Caparossoli in cassopipa (sea clams), moleche fritte (soft crabs), Risotto Nero (Squid ink risotto) or Castraure impanae ( Braised Artichoke Bottoms). Typical Venetian desserts are Fritole (fried sweets), Galani (crispy fried pasta), Spuncioti de caramel (Caramelized nuts) o Baicoli (Venetian Biscuits). In Venice, you can practice all kinds of sports, but the most common ones are water sports. You can also try Stand Up Paddle Surfing which is becoming very popular lately or traditional Venetian rowing with its particular technique of rowing with one oar. For those interested in playing golf, there is a Venice Golf Club on the Island of Lido. Venice is really a magical city during the day, but when the sun goes down it can sometimes feel like you are in a ghost city, especially during the winter time. You can find some classical music concerts, opera and ballet performances in churches or theatres, like in Teatro La Fenice which is one of the most famous theatres in the world. In Venice people usually eat early and then they go in their favorite bar, drink “spritz” ( a local drink made of prosecco o white wine, bitters and sparkling water) and have a nice chat with their friend. 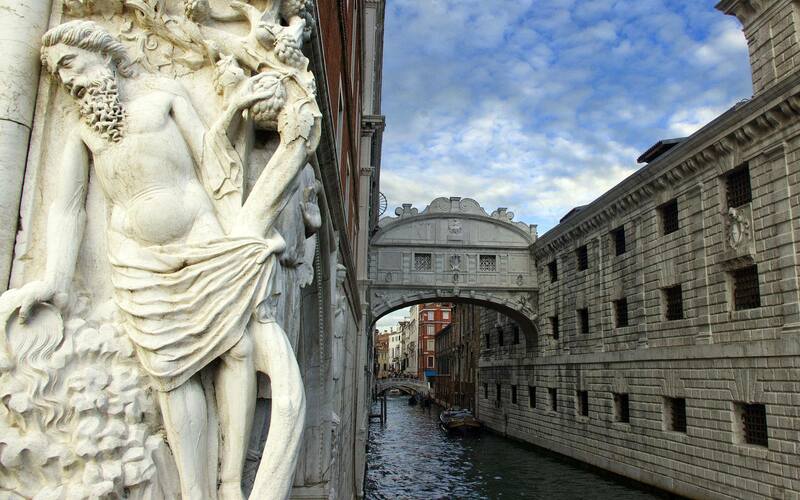 Venice is also famous for its casinos, in the city there is the oldest casino in the world which was opened in 1638. 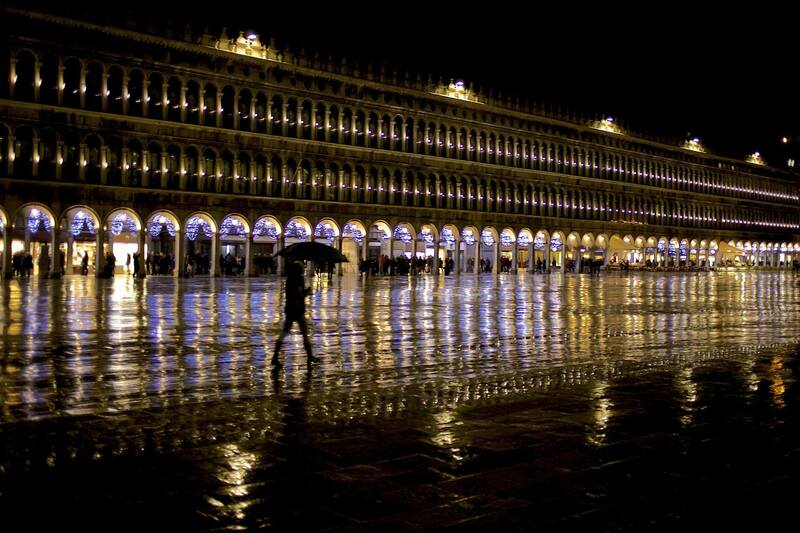 You can find lots of small and cozy bars in the streets of Venice at night, but finding a club will be a bit difficult. 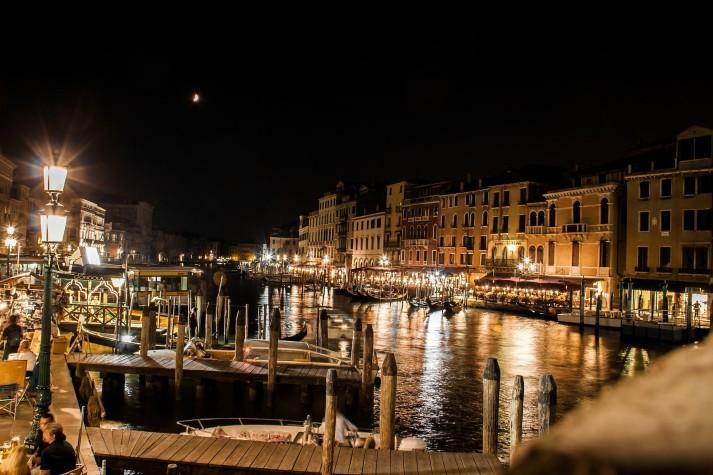 In top tourist areas, you cannot usually find bars or clubs, for that you will need to go to Campo Santa Margherita or Mestre which is a mainland city near Venice. In summer, you can find a lot of entertainment, clubs, bars, beach parties on the Lido island or Jesolo, a beach resort about 40 km from Venice. 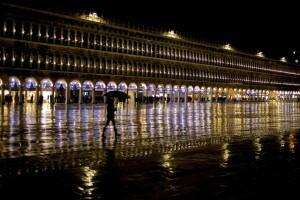 Venice has a Mediterranean climate, characterized with cool winters and very warm and humid summers. The hottest month is July with an average temperature of 23°C (73.4°F) and 288 hours of sunshine, but the temperatures can sometimes hit 40°C (104°F). Winters are cool, with average temperatures in January of 3°C (37.4°F). Snow doesn’t fall very often in Venice and those few times that falls it doesn’t stay on the ground for too long. 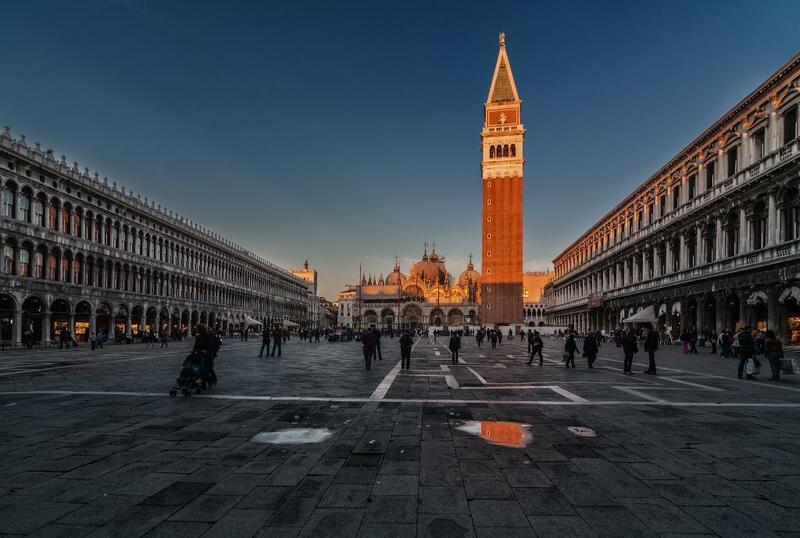 When there is a high tide, St Mark’s square goes under water and it can be an interesting experience to walk around Venice with the high tide. Lido di Venezia is a 12 km long island, where the Venice Film Festival takes place every September. It is a natural land barrier between Venice and the open sea, famous for its beaches and nightlife. Murano, Burano, Pellestrina and San Giorgio Maggiore Islands. 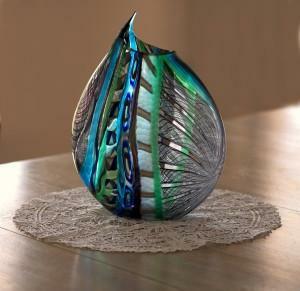 Murano glass, a special type of glass made on the isle of Murano. 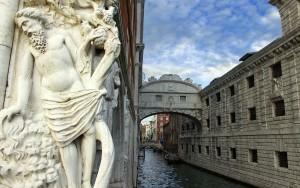 You can visit the factories and numerous shops on the island or in Venice. 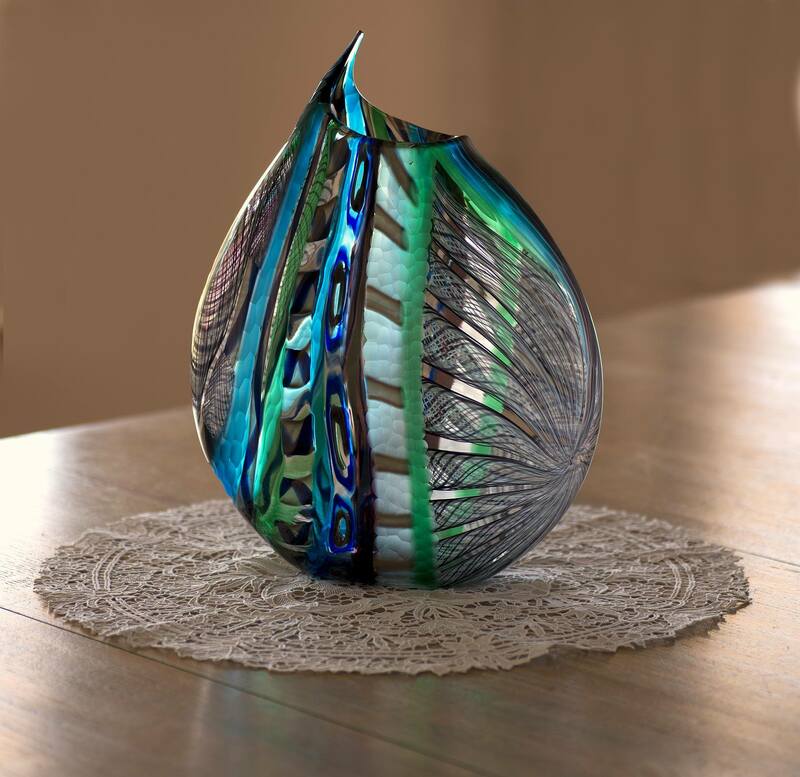 Be sure when buying Murano glass that it has their official trademark. Burano Lace is the first true lace. You can buy it on the island of Burano, where you can visit the School of Lace and see how it is made. Gondoliers hat is also a famous Venice souvenir, attractive and practical for those nice sunny days in Venice. 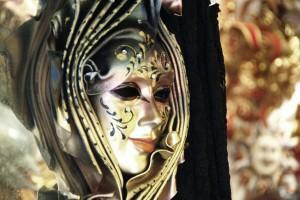 Traditional Venetian mask is a must have souvenir. Masks are made of leather, porcelain or Murano glass, you can find them everywhere and the cost is around 20 – 30 €, obviously those made of Murano glass cost a bit more. You can also buy various other souvenirs in numerous city shops like wooden puzzles of Venetian landmarks, mini Lion of San Marco or other Venetian landmark sculptures, Pulcinella and Arlecchino miniatures, mini Gondolas etc. Italy do offer great wines. It would be the perfect place for wine lovers and to those who’s just starting to love wines.